How can you combine both of these templates? I need to destack a sleeve of parts that are in a pallet sequence. 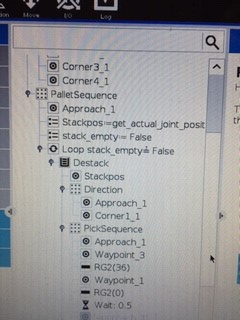 Example: The program would start at the first pallet location then destack that column, then go to the next pallet location and destack that. Are there always the same amount of parts in each position on the pallet? I would say no just in case. I did get this figured out yesterday. I ended up using some variables, a loop, and a variable position. With this I was successful in destacking one pallet position then moving onto the next pallet position. Can you better explain how you did the variable position. I'm trying to destack but can't seem to give the robot enough information to be able to teach it where the next position is. 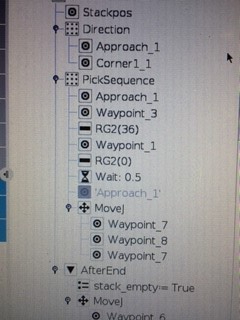 I added the variable position right after the "Approach_1 in the pallet. This added a loop with the destacking until it is finished. I have added two picture of my program to help.